An often overlooked maintenance item on vehicles is the replacement of engine timing components on vehicles. Some vehicles are equipped with timing belts to drive the camshafts of the engine. Others have timing chains to accomplish the same purpose. 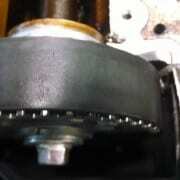 The advantage of timing belts is that they run very quietly and efficiently under a wide variety of conditions. They are also easier to service and maintain. The disadvantage is that they require more regular replacement than timing chains. Most modern vehicle manufacturers who use timing belts have recommended replacement intervals of somewhere between 60,000 and 120,000 miles and between 7 and 10 years. Most timing chains are designed to not need preventative replacement for the life of the engine. However if a timing chain does fail the cost to repair it are much higher than the costs to replace a timing belt. When either a timing belt or timing chain fails, the results can be catastrophic in terms of engine damage. If the camshafts and the crankshaft get out of time with each other, the valves can collide with the pistons causing very expensive damage to the engine. This is the reason why you don’t want to neglect or take shortcuts with your timing belt service. It is also recommended that you replace related components that run on the timing belt such as tensioners, pulleys, and water pumps. Timing chains do not usually require regular scheduled replacement, but it is important to change your engine oil regularly as that is what lubricates the chain and pressurizes the tensioners on the chain. If your oil gets too thick or contaminated it can cause premature timing chain failure. Also, warning signs of impending timing chain failure such as a clattering noise on start up or a rattle in the front of the engine while it is running should not be ignored. At Mountain Valley Motors, we can advise you regarding the factory recommended replacement intervals for your vehicle. We also use only the highest quality belts and components from manufacturers like Dayco, Continental, and Gates.